This is a big week for comic books. Frank Miller’s much anticipated Dark Knight III is released on Wednesday November 25th and it is carrying a lot of buzz. The industry needs a big event like this and more importantly the industry needs Dark Knight III to be really, really good. I can’t overstate Frank Miller’s importance in comics. Recently CBD posted Dylan Routledge’s great piece on Miller. Click here if you missed it. This week our always on the pulse Spotlight contributor Mike Huddleston delivers a great argument for two classic Frank Miller issues. Mike’s arguments are sound and his passion for comics always shines through. This week Mike Huddleston presents Spectacular Spider-Man #27 and Daredevil #158 as the Undervalued Spotlights. Let’s turn things over to Mike. Walt. This week’s Undervalued Spotlight features the first Marvel comic works by legendary artist (and writer) Frank Miller. 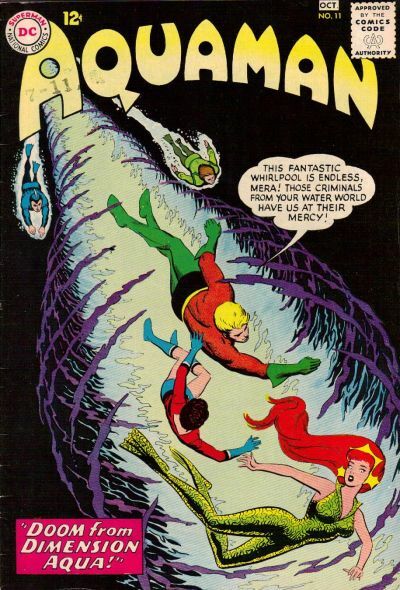 Mr. Miller famously took a floundering Daredevil title and turned it in to one the most popular and must read comics in the back half of the bronze age. 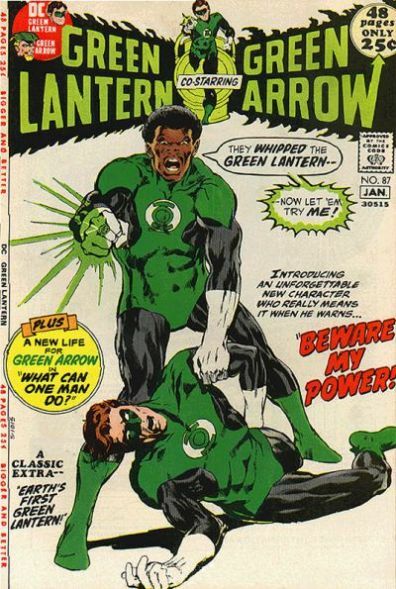 It was right up there with all the X-titles and Spider-Man titles, and at least in a few people’s minds surpassed them. We will look at two books today. 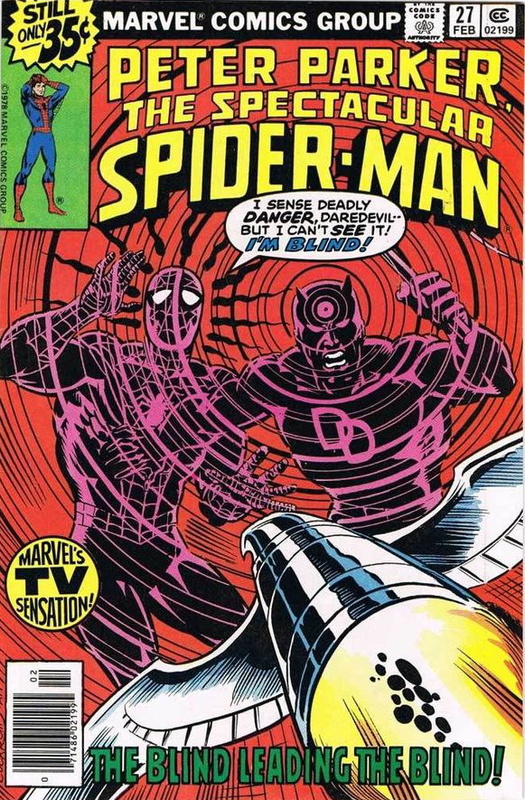 Spectacular Spider-Man #27 was Miller’s first rendition of Daredevil who was guest starring in the book. Daredevil #158 was Miller’s first work in Daredevil that began a long and very successful run on the title. A few months ago I did an Undervalued Spotlight on Amazing Spider-Man #39 and John Romita’s first Spider-Man work following Steve Ditko’s run. Undervalued Spotlight stalwart Darren Graham pointed out correctly that Romita’s first Spider-Man was in Daredevil #16 and that book should also be given consideration as the Romita Spider-Man holy grail copy. First is first. To that end we are spotlighting both of Millers works. 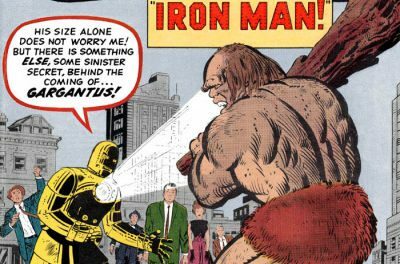 There are some delicious similarities in the way John Romita and Frank Miller got their starts with the characters that made them famous. Romita was drawing the Daredevil title, drew Spider-Man in a cross-over issue and then took over the Amazing Spider-Man title. 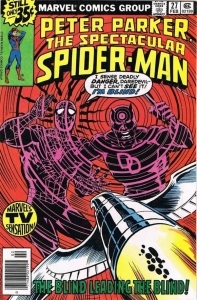 Miller drew Daredevil in a Spider-Man title in a cross-over issue, and then took over artist and later writing chores the Daredevil title. The villain in both cases was the Masked Marauder – 13 years apart!! Let’s get to the books…. Art by Frank Miller, Inks by Frank Springer and story by Bill Mantlo. Frank Millers 1st Daredevil work takes place in the second installment of a three-part Daredevil/ Spider-Man/ Masked Marauder battle. The Marauder has blinded Spider-Man with an optic-blast to his eyes. Most of this issue has Daredevil trying to help Spider-Man adapt to a condition he knows all too well himself – blindness. More importantly we get to see Millers 1st Daredevil. This Daredevil has been hitting the gym, more muscular and defined than previous incarnations. I like his Spider-Man too. Miller draws the next issue as well in the wrap up battle with the Masked Marauder. A bridge issue in the story itself, it’s Millers 1st work that is star of this book. Art by Frank Miller, Inks by Klaus Janson and story by Roger McKenzie. 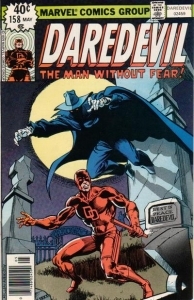 In Miller’s first art work on the title he gets to draw the finish of Daredevils biggest nemesis of the previous four years The Death-Stalker. The Death-Stalker knows Daredevil is Matt Murdock and orders his Unholy Three to capture Matt and take him to a cemetery. The Black Widow tries to stop them but only gets one. It turns out he is the lucky one (Bird Man) as the other two are killed upon Matt’s delivery by the Death-Stalker. Before he kills Murdock we are treated to a pretty cool origin story of the Death Stalker, who was Daredevil’s old foe the Exterminator from away back in Daredevil #39. The Death Stalker and his Hydra supplied “death touch glove” live in two dimensions. He phases between the two in planned intervals. His plans go awry in this battle when Matt turns out the lights at the cemetery and the Death-Stalker phases back into solid form in the middle of the grave stone he prepared for Matt killing him instantly. The book is a great start for Miller who takes over the writing duties as well on the book in issue #168 (Walt’s Undervalued Spotlight #83). These books already receive a fair amount of love from Overstreet and I believe they have a good chance to continue with steady price escalation in the future. For fun I went back to Overstreet guide #35 and compared prices on the current 45th Overstreet guide. These are 3 pretty good books. They are not run books. 8.0 grade looks like dead money on these books to me. Do others see it this way as well? 9.0-9.2 are moving along at what I would call a consistent or steady pace. You would need to buy these books in at least this grade for an investment IMO. I do like the potential of Daredevil #158 the best of the two. Miller’s run on Daredevil is well loved by many and I think will hold up well in the long term. Spectacular Spider-Man #27 – well first is first, and past results match or are a little better than the horse I’m betting on! Very nice, as usual. For the last few years I have thought PPTSS #27 higher grades are undervalued. Daredevil 16 & 158 have proven to be solid investments that should continue to rise. 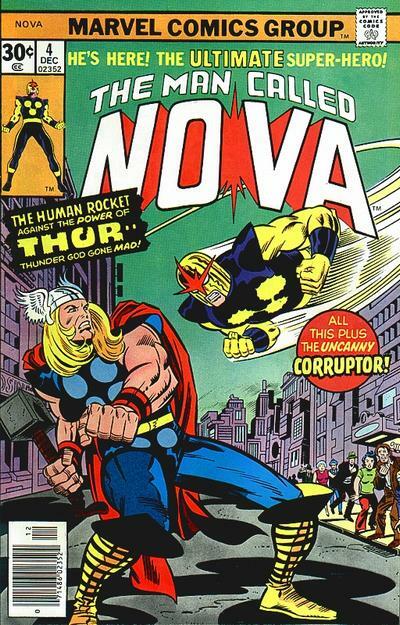 The sales volume of PPTSS was tremendous – Marvel’s most popular character easily drove the sale of three monthly titles. So no issue is rare whatsoever. But as has been discussed many times in this forum, scarcity is certainly not the only indicator of prices. We’ve all seen that in recent years with key issues from the 1990’s skyrocketing. Well researched Mike. I’ve always loved both books… DD#158 in particular is one of the few where 1st artist still hold some decent value. It’s also the start of one of the greatest run of books ever. DD#168 has also been hot as well in anticipation of Elektra on Netflix. For those who’ve been patient and held on to these are about to be rewarded. Eric I too am a big fan of team-up books. Although they were created as showcase type books for the guest stars, there are plenty of great stories to be found in them. I think that Miller DD run has a host of terrific books in it. I like 158 and 168 the most followed by 181 and 190 and the “Born Again run and more’. Sounds like I was the only person not at the Toronto show. How did you make out? The show was great. The usual group of people were there, plus lots of new vendors and attendees. I was selling mostly new overstock, all from the past 2 years. Sold about $500 worth. It’s always interesting to see what people are buying and to chat with other vendors about the market. The Toronto show has steadily grown and there is a core group of followers that come to every show. Some even said they prefer to buy at this particular show as opposed to the bigger shows downtown. I guess there’s something to be said for the casual atmosphere.